3591 - Edelbrock Air/Fuel Components - Pann Auto Performance - San Diego largest aftermarket automotive performance parts - What do you drive? This Edelbrock Wide Band Air/Fuel Ratio interface unit will not only work with all current Edelbrock EFI systems, but with any aftermarket EFI system that can accept a 0-5 volt input for monitoring Air Fuel Ratios. Features two independent 0-5V analog outputs that are linearly scaled with 0V=10.0 AFR and 5V=20.0 AFR. Includes interface unit, sensor, weld-in bungs and all necessary wiring. Does not have internal data logging capability and only includes a single oxygen sensor. 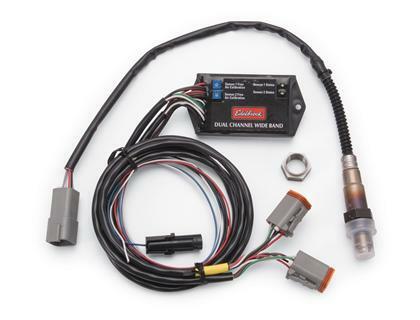 For data acquisition applications requiring two oxygen sensors, use Dual Channel Wide Band kit #91170. This Wide Band Oxygen Sensor is a replacement sensor for our Wide Band Interface Kits. Sensor is complete with special Deutsch connector for direct replacement. This extension cable measures 12 feet in length and is designed for extending the Edelbrock O2 Sensor #91171 to the Edelbrock Wide Band Sensor Harness. It is provided with the connector terminated on one end only, allowing for the cable length to be tailored to custom applications. It can then be terminated with the provided connector. This Air/Fuel Monitor displays the actual air/fuel mixture in ratios from approximately 12 to 15:1. Use it to guide carburetor adjustment and jetting or to improve ignition spark advance curves. Not for use with leaded fuels or alcohol. Kit includes oxygen sensor, bung, harness, display unit and installation instructions. This Weld-On Bung can be used with Edelbrock QwikData 2, Pro-Flo 2, Pro-Flo XT or any application requiring an Oxygen Sensor installed in the Exhaust system. It’s manufactured from steel stock and has 18 × 1.5mm internal threads.